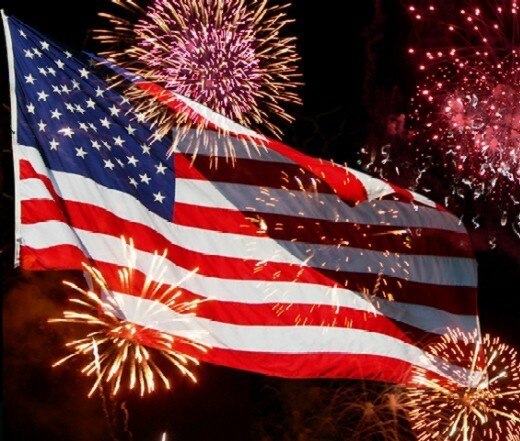 Perfect Potato Salad for the 4th of July! Summer holidays and potato salad, always boiled down to the name “Aunt Frances," not only my Aunt Frances, but Bill’s Aunt Frances also. They were the “go to ladies” for potato salad back then, but unfortunately I never got either of their recipes and so am always on the hunt for the perfect potato salad recipe, and this one I’ve got for you today is close. This recipe, slightly adapted here, was in the Chicago Tribune by Leah Eskin, in her “Home on the Range” food column. By the way, she has a great cookbook, Slices of Life, that’s not only filled with recipes, but a generous helping of her life stories that happened on her way cooking and baking when she was young, and later for her own family. Back to this recipe, it strays a little from traditional potato salad and makes the most of summer, with its surprising good taste. I would’ve never thought of including peas in potato salad ~ it’s a perfect match, accented by mayonnaise combined with sour cream, dill, lemon zest and Dijon mustard, with lots of chopped red onion thrown in and garnished on top with sliced olives for Bill, the potato salad conniseur! It’s not a sweet dish, just savory and delicious, that’s good warm, but is just as delicious when chilled. we do love a good potluck! Boil: Settle potatoes in a large pot. Cover with cold, salted water by 1 inch. Bring to a rolling boil, turn down to a low boil and cook until potatoes are easily pierced with a skewer, about 25 minutes. Cut: When potatoes are cool enough to handle (but still warm), cut into 1-inch cubes. Pile into a large bowl. Sprinkle in peas (no need to defrost) and red onion. Mix: Whisk together mayo, sour cream, dill, mustard, zest, and salt and pepper to taste. Pour this dressing over potatoes. Mix gently with a soft spatula. Arrange sliced olives over top, if desired. Serve: I like this still warm, but it's good at any temperature; keep cold for picnics. factor with this shrimp dish! 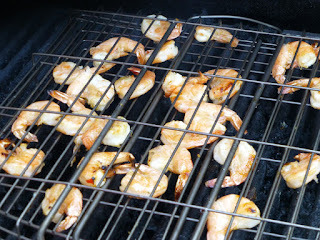 This recipe, the source is a mystery to me; for shrimp on the grill is super simple and comes together easily. Shrimp marinates in a zesty sauce of garlic, lemon juice, oregano and parsley, plus a little sweet chili sauce, with a sprinkling of crushed peppers and hot sauce for heat. Then its all quickly grilled to perfection. 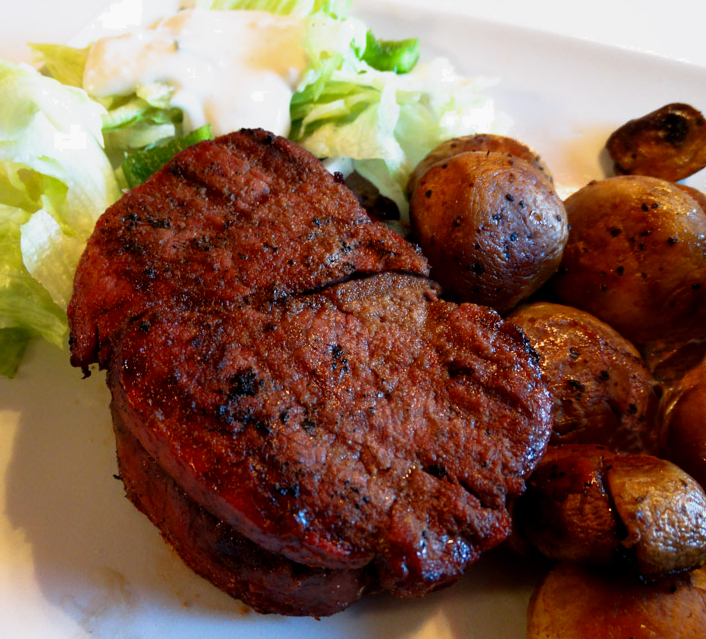 I will be making this again soon for Bill to grill ~ we thought it was simply delicious! 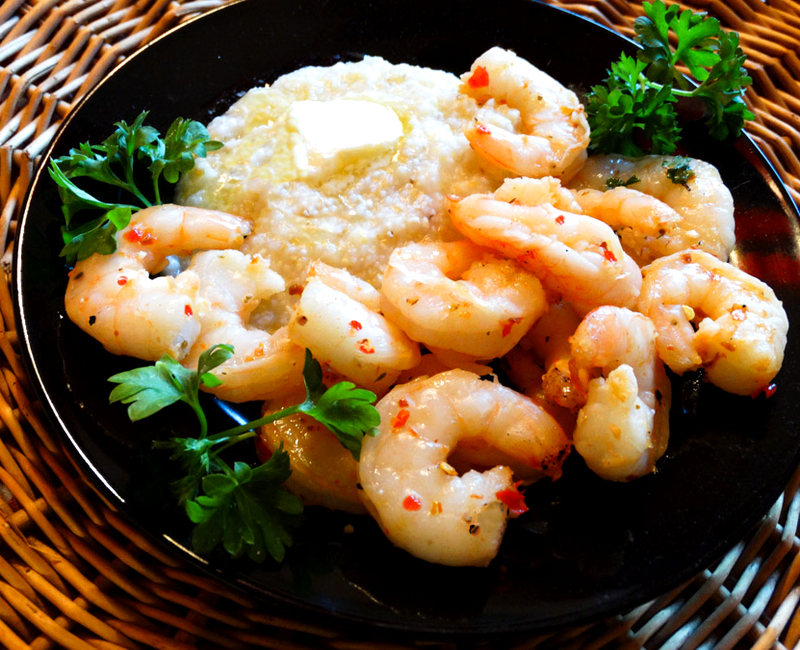 With a side of stone-ground garlic grits ~ it doesn't get much better than this! Wash shrimp well, using a pair of kitchen shears or knife, cut through the shell along the back of each shrimp, peel and devein. Pat dry and place in a resealable bag. Combine remaining ingredients in a small pan, simmer for 10 minutes; cool. Pour marinade over shrimp, seal bag and shake to coat shrimp. Refrigerate 1 hour, turning bag once. Remove shrimp from marinade, wiping off excess. Grill until opaque throughout, 2-3 minutes per side. And a shout out to Kris Bryant!!! He made MLB history last night with a 3 Home Run and 2-double performance! And, by the way: today, the strawberry moon* will happen to coincide with the summer solstice, the first time that has happened since 1967, almost 50 years ago. The next one won't occur again until 2062! It looks like a beautiful vivid pink flower! 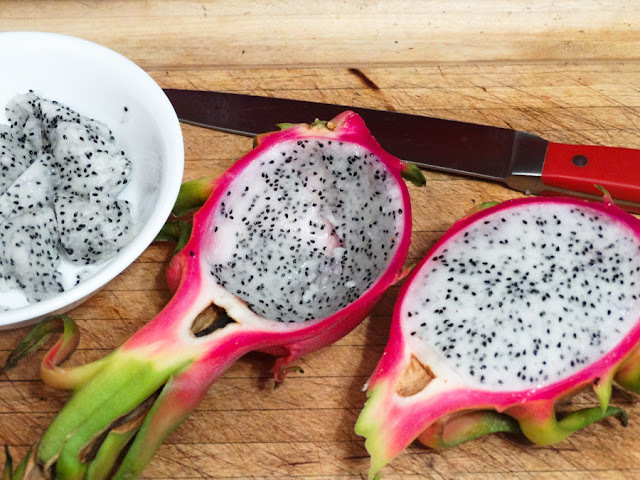 Pitahaya-producing cacti fruit, known in English as Dragon Fruit, is indigenous to Central America, but is also grown and exported from Israel and several Southeast Asian countries, such as Vietnam, Thailand and Malaysia. 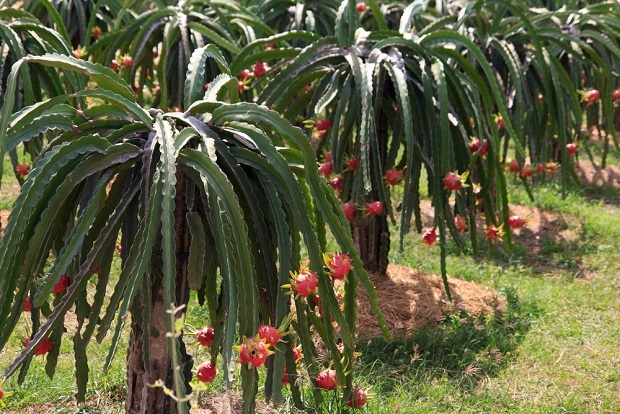 Its succulent stem provides the uniquely delicious fruit with moisture in the arid climates where it grows. 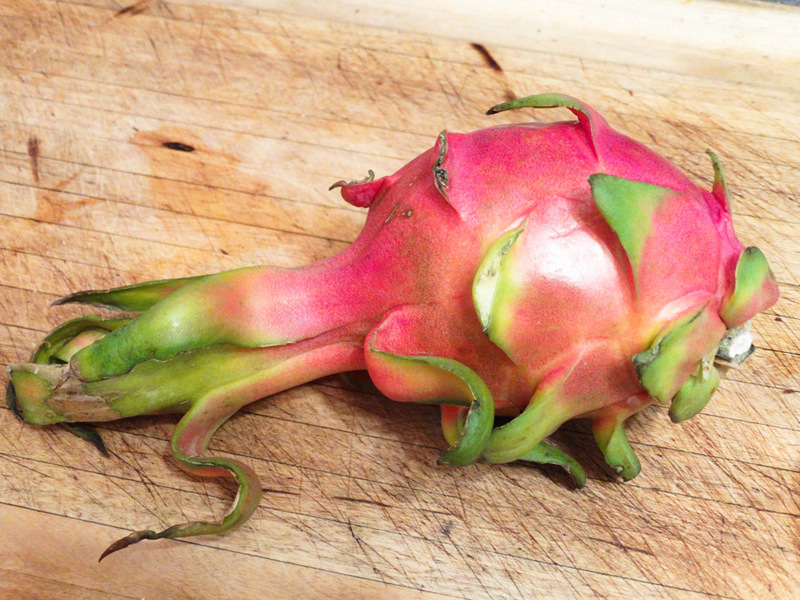 Dragon fruit comes in 3 colors ~ 2 have pink skin, but with different colored flesh (one white, like the one I show here, the other red), while another is yellow (looks sort of like a pineapple with spikes), with white flesh. The flowers are nocturnal, and bloom in full for just one night. That means they have one wonderful evening for a bat or moth to help pollinate it and turn it into a dragon fruit, otherwise the 6” spiky greenish white bloom wilts by sunrise. The leaves are slightly overlaid, similar to an artichoke on the outside, with a plethora of small, black, edible seeds filling the inside flesh. The flavor is mildly sweet ~ reminds me of kiwi, with a sort of crunchy texture. Look for dragon fruit at your local farmer’s market or grocery store to make this soothing little drink. 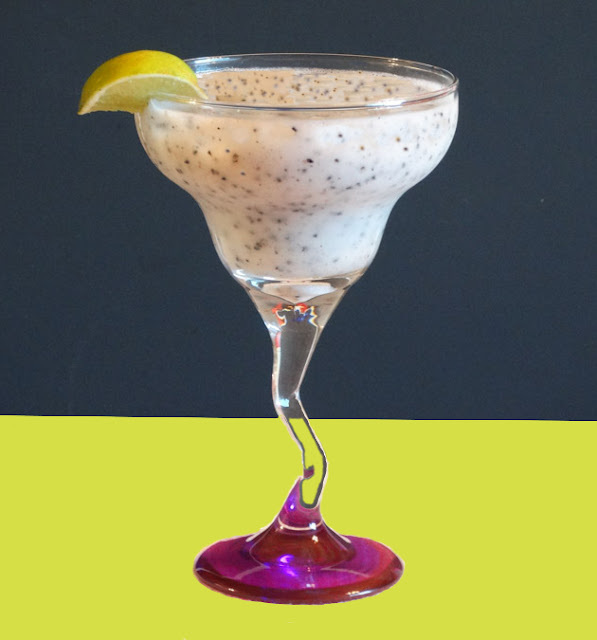 It’s refreshing, and light, perfect for a summer cocktail ~ dragon fruit, coconut milk, lime juice, which all blends nicely with white rum! Place ice cubes in blender and crush. Add remaining ingredients, except lime slices, and purée until combined. Pour into cocktail glasses and garnish with lime slice. In small saucepan, bring equal amounts of granulated sugar and water to a boil; simmer, stirring occasionally, until clear and syrupy, about 2 minutes. Let cool completely. * The strawberry moon is the nickname given to the full moon in the month of June. 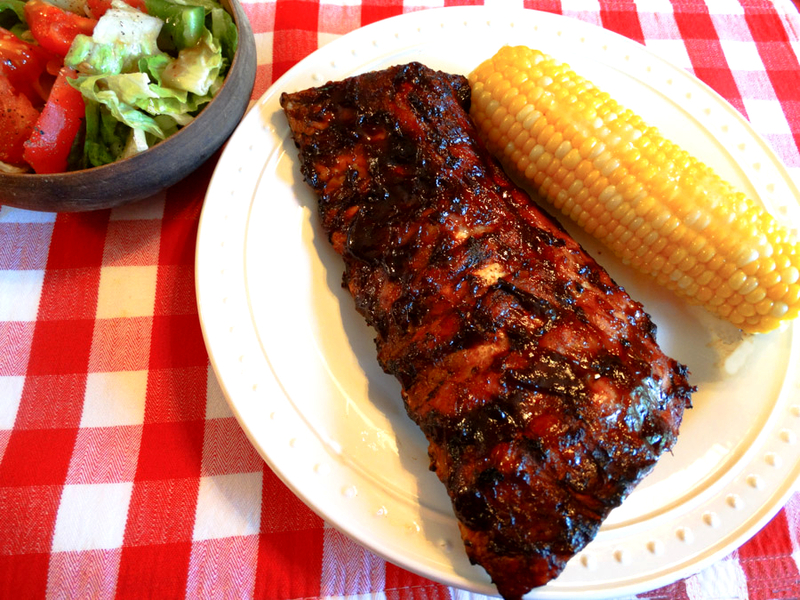 Best-Ever Barbecued Ribs for Dad's Day! Bill buys his ribs from the local butcher ~ they’re perfectly trimmed and meaty. He had the butcher cut a rack of ribs in half and bought another half, making 3-half racks, being more manageable in cooking on the grill. 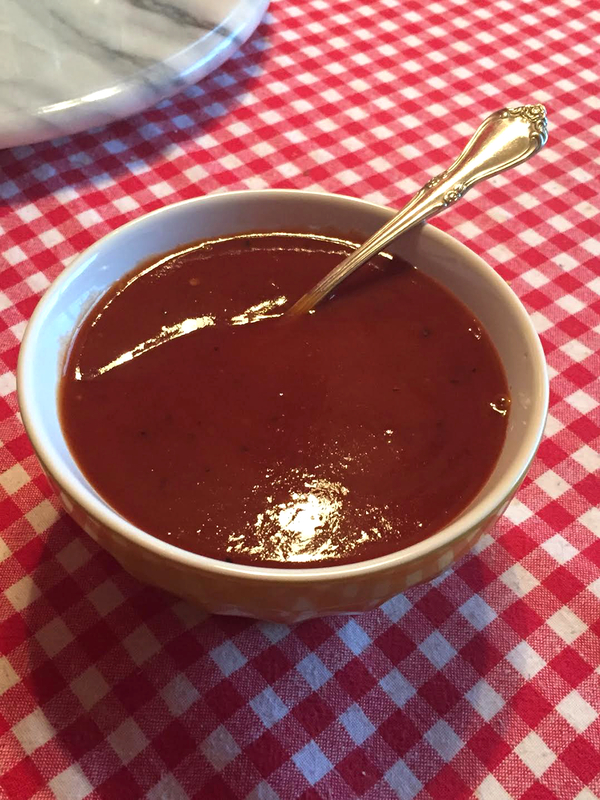 I know there is a plethora of barbecue sauces at the grocery store, but I’ve yet to find one that rivals making my own from scratch. It's easy to make, it tastes better, I know exactly what's in it; why buy bottled? 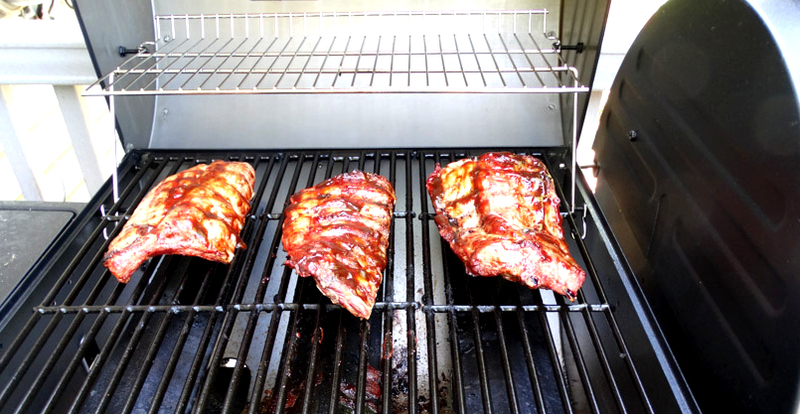 There’s nothing like smoky juicy ribs ~ they smell and taste like summer all the way ~ great for any Dad on Father’s Day! Place ribs bone side down in the center of the cooking grate over direct medium low heat, making sure they are not over a direct flame. 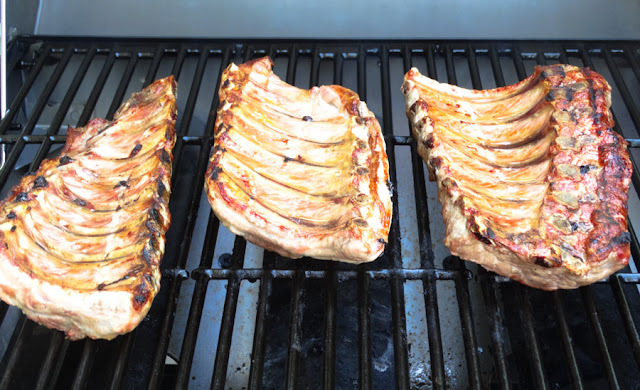 Grill until meat is tender and has pulled back from the ends of the rib bones, about 1 hour. Start basting the ribs 15-20 minutes near the end of cooking time, turning and basting the meat frequently. Place all ingredients in a saucepan, combine well and slowly bring to a boil over medium-high heat. Reduce heat to medium-low and gently simmer until, dark, thick and richly flavored, 10 to 15 minutes. 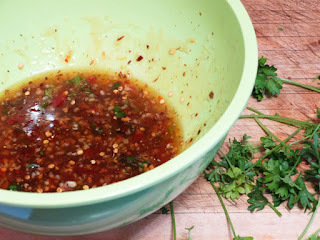 Transfer the sauce to a glass jar and store in refrigerator; it will keep for several months. all you dad's out there! We loved this dish! It’s excellent! The recipe is a slightly adapted Martha Stewart recipe: After cooking the bacon, I drained all but a teaspoon of the drippings in the skillet, added the asparagus and mushrooms, and then a little water to make sure the asparagus cooked evenly. 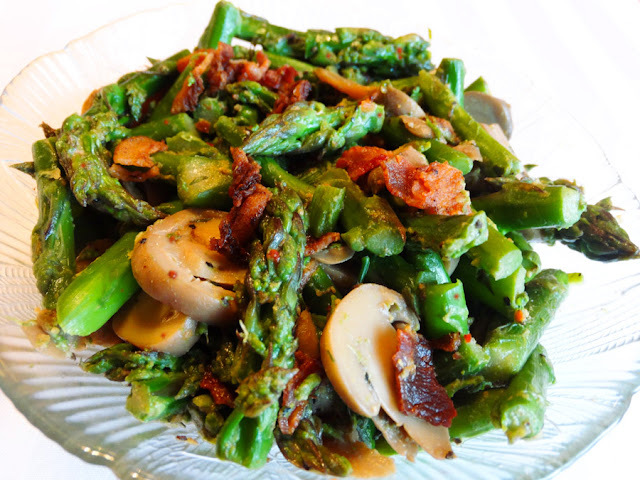 Asparagus has a unique taste and does a great job of working with other flavors, such as the Dijon mustard and bacon here. This recipe succeeded from start to finish, producing a stir-fry asparagus that was absolutely perfectly cooked, surprising us with an excellent side. If you’re crazy about asparagus, give this a try! It’s truly mouthwatering delicious! In a large skillet, cook bacon over medium heat, stirring occasionally, until browned. Transfer to paper towel to drain, remove all but a teaspoon of bacon grease. 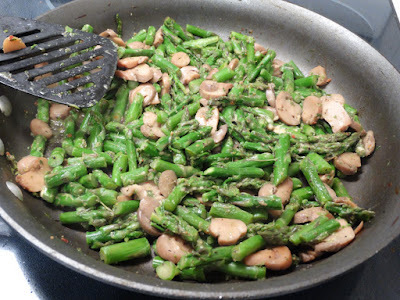 Add asparagus, mushrooms and water to skillet and season with salt and pepper. Cook until asparagus is tender, about 10 minutes. Do not overcook. Remove from heat and stir in bacon, mustard and parsley. *If using fresh mushrooms, add ¼ cup water only if needed. Bill is mighty proud of his new grill. It's 3 connected grills: one for gas, the second for charcoal and the third is a charcoal smoker. For extra flavor, you can’t beat a charcoal grill, but sometimes we want quick and easy with the gas grill, and the smoker is a must for Bubba’s summer sausage and smoked salmon. He's strip steak all the way and I’m filet mignon; although, if we come across a great looking sirloin steak at the butcher shop, it’s a go. Lots of garlic for me! 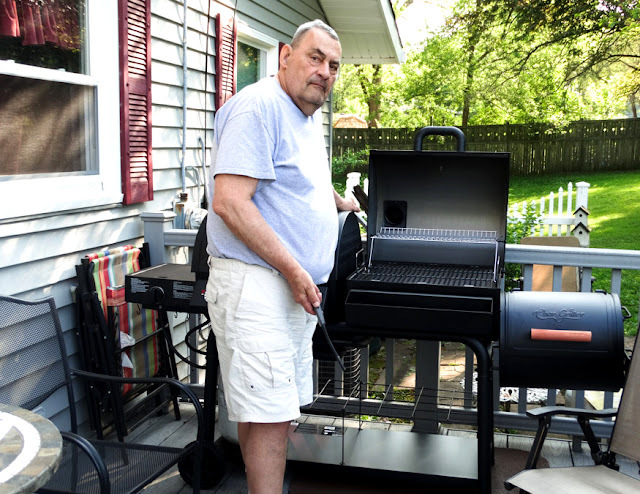 Bill has no grilling secrets; just those many years of watching my dad grill taught him to pay attention and don’t overcook the meat. It’s pretty straightforward and pretty much my favorite meal: a grilled steak with a green salad, sautéed mushrooms and the veggie du jour. 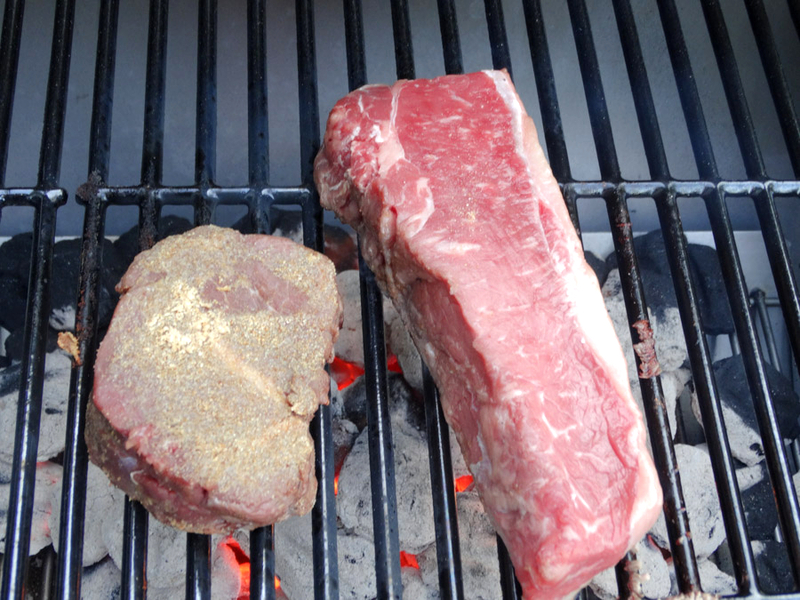 Shake a little salt on the meat before grilling, and a heavy sprinkling of garlic powder for me. 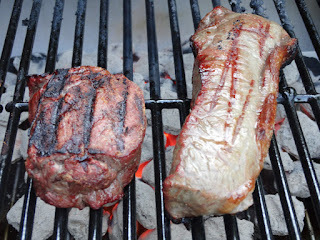 Another thing my dad told Bill ~ no steak sauce, ever!